Moving a Swing Windows on the screen is like a small entertaining game.User can change the place of the window application any where on the screen, while moving Swing Windows from one place to another place user can get the same result of an application then the resolution of the system will not be visible. In moving Swing Windows the resolution of the system will be visible that can be visible via x-axis and y-axis direction. 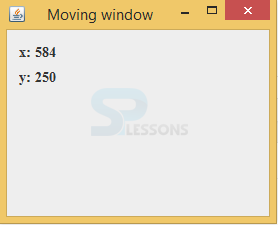 The complete logic behind the moving window has been shown in below example. This example describes what is technique behind the moving window. Create a package and import all the required packages to hire the properties. import java.awt.Container;//import all the required packages. 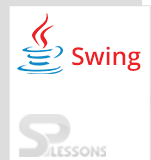 Create a class with the name SwingMovingWindow that should extend from the JFrame and should implement the ComponentListener. The functionality of ComponentListener is to receive the events. Create labels x and y and create constructor with name of class name. Create the object to the group layout and create the layout to the container pane and add listeners that performs on components as follows. Create the labels x and y, add font size, set the bounds. Set the gaps between the components. Create horizontal group layout and vertical group layout with parallel and sequential modes and components should add labels x, y by providing gaps between the components as follows. Set the title to the window and write the method to close the window. Create the three methods and here used componetmoved() remaining methods are empty methods. Here get the components of x and y. Output will be as follows.When user move the window then resolution of the application will be shown via x and y axis. ComponentShown, ComponentHidden, ComponentMoved, ComponentResized will be in ComponentListener interface.